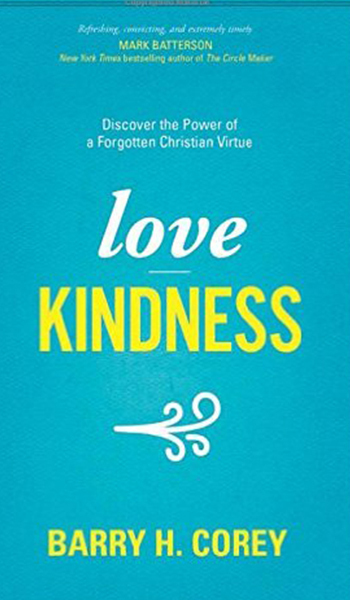 Barry H. Corey, Love Kindness: Discover the Power of a Forgotten Christian Virtue (Carol Stream, IL: Tyndale, 2016). Few things set off heated arguments on my Facebook timeline like posts about politics. Never in my lifetime have disagreements among friends—well, Facebook “friends”—been so sharp, so heated, so personal, and so deep. Even the language used is extreme: People aren’t just upset, they’re outraged. They don’t just disagree with someone else’s beliefs, they destroy her arguments. They don’t think she’s a nice person in the other political party, they think she’s a fool who belongs to an evil organization. And the vast majority of my friends are Christians! In Love Kindness, Barry H. Corey writes that Christians’ political aggressiveness is counterproductive. “Our increasingly shrill sounds in the public square are not strengthening our witness but weakening it.” He contrasts aggression (“firm center, hard edges”) with niceness (“squishy center, soft edges”), and concludes that neither should be our objective. Rather, with Micah 6:8 in mind, he urges us to “love kindness,” to combine “firm centers” and “soft edges.” We need, if I could paraphrase his point, both conviction and civility, both good principles and good manners. Kindness is much more than manners, of course. It is a fruit of the Spirit (Galatians 5:22). And it keeps company with other virtues, such as humility, hospitality, and authenticity. Christians who want to change the world might keep in mind that “God’s kindness is meant to lead you to repentance” (Romans 2:4). If we haven’t changed people’s minds, perhaps it’s because we haven’t followed God’s example. Through poignant storytelling, self-deprecating humor, and insightful biblical analysis, Corey points the way to a lifestyle of kindness. …we become more involved in the culturally unfamiliar. …we are creators of goodness and beauty. …we approach the growing opposition in our day by leading with humility. …we fear not when our grace is met with humility. …we remain even more deeply rooted in biblical faithfulness. …evangelism is at the heart of why we live this way. …we need to remember that Christ-centeredness means we will never be marginalized. If you’re tired of reading (or writing) heated Facebook posts that don’t seem to change anyone’s minds, I encourage you to read Love Kindness. And then to do it. P.P.S. This review originally appeared at InfluenceMagazine.com. I also got to wondering – do you and Dr. Corey already know each other? Great review of a very timely message. I can’t help but think how much the Spirit is grieved by so much rhetoric these days from people who carry the label of Jesus. Some good insights – your review has made me very interested in reading his book. On point 4 I expected to read “…we fear not when our grace is met with hostility.” Did you accidentally type humility or is that his actual point? If so, could you unpack what he meant a little bit? In other words, I think he means that being kinds entails a way of life that recognizes the potential of hostility but isn’t overcome by fear of it. After reading his book I will be testing book contents to see if it aligns with the Emergent church movement. The more important question is whether it aligns with Jesus. George, perhaps idealism is the primary means of anti-intellectualism now. The only way to answer the question of whether a book’s message “aligns with Jesus” is by analysis. And analysis is done by some means or other, and Pat’s question is as good a place to start as any unless you’ve got a better one. Actually, perhaps I could suggest a better way of analysis. Books with significant error are always at war with themselves. Full of contradictions. Love Kindness is no different. You won’t find that in any of Dallas Willard’s books. The problem with Love Kindness is that it will be a confusing book for those who try to analyze it. Look at recent critical reviews of the book on Amazon if you want to see a detailed analysis that attempts to cut through the fog of such confused rhetoric. And as one of the reviewers says or hints, much of the anti-polemical polemics offered by people like Corey is an attempt to squelch opposing views, and thereby win the debate without a debate. Barry Corey is the president of Biola University and has an earned doctorate. An anti-intellectual he is not. Having both read the book and interviewed him about it, I’m not concerned with accusations that his book doesn’t align with Jesus. It does. George, the common statement of the anti-intellectual was “God said it, I believe it, and that settles it”. Whether that was fair or representative or not I’m not sure, but if there were those that said it was most definitely a hallmark of the anti-intellectual. Now you say “A phd and president of a Bible college says it, I believe it aligns with Jesus, and that settles it”. Do you see the commonality here?